We are inviting individuals and businesses like yours to partner with us while we continue to grow and develop our players on and off the field. Fairhope Soccer Club is a non-profit organization that includes over 500+-registered soccer per season. Fairhope Soccer Club offers a variety of programs. For those players U13 & above, who want to continue on the higher-level competitive path, FSC has a partnership with Gulf Coast Rangers. The support of corporate & local business and the community is vital factor for our club’s success and continued support ensures our sport also remains affordable for all player and their families. There are numerous costs involved in maintaining quality practice equipment, running recreational leagues & tournaments as well as enhancing our soccer complex. We also are able to provide financial assistance for those children who may not be able to participate in our soccer programs. Fairhope Soccer Club is funded and operated by dedicated volunteers, a board of directors and committee members and a coaching staff. FSC is organized under Section 501(c)(3) of the Internal Revenue Code as a charitable organization. Our soccer programs teach respect, sportsmanship, teamwork, education, personal responsibility, integrity, trust and commitment. 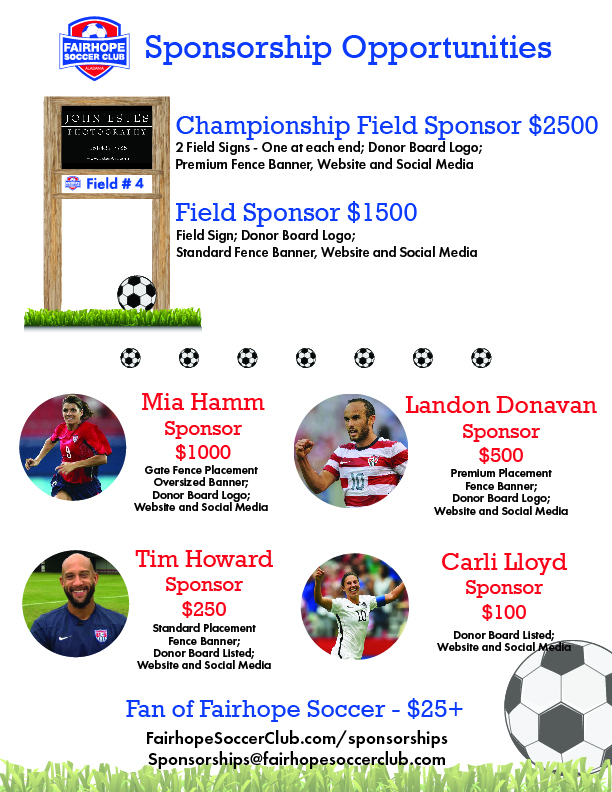 We offer many sponsorship opportunities to fit any budget. We’d like to offer your business our support and the opportunity to promote your interests to the hundreds of people who visit our complex each week and throughout the year and the many more who follow our club’s progress via attendance at events, our website, and social media. BECOME A FAIRHOPE SOCCER FAN TODAY!